Our Real Estate Class Schedule has EXPLODED! New classes in Fort Myers and Naples. There is definitely a buzz going on right now with people interested in getting into real estate. Our phones are ringing and we’re driving a lot of traffic to our website. Due to the increase in demand, we have added 6 NEW real estate license classes. We added 4 in our Fort Myers location and 2 in Naples. Now we have a full selection of Weekday, Evening and Weekend courses to choose from. As always, our students can mix-and-match not only the class type, but also the class location to fit their schedule. This allows for maximum flexibility for our students. Something else I’d like to add is that we have extended our discount of $20 Off in Fort Myers and $50 Off in Naples all the way to April 26, 2009. I’d advise people to take advantage of this offer by enrolling now. Our upcoming class start dates are April 18 Weekends in Naples, April 25 Weekends in Fort Myers, and we have two Fort Myers classes starting on April 27 (a Weekday and an Evening). That’s all for now. Give me a call if you have any questions. Ok, I just learned how to put a video into Youtube, only about 4 years behind the curve, but that’s ok because I never had a video to put up until now. Charly Caldwell at Internet Services Group www.isgfl.com/ has been helping me out a whole lot with our internet marketing and SEO (Search Enging Optimization). He was watching Wink News the other evening, March 16, when he saw the teaser at the beginning that flashed our Logo. He immediately jumped to action and got his video recorder turned on so that he could “tape it” for me (my words, not his). I know I posted a link to the Wink News website with the video yesterday, but this is significantly better this way….for many reasons that I’m not going to get into right now….mostly because I don’t understand it, I just do what I’m told. So here’s the video on Youtube. See my post from yesterday for an explanation of why Larson Educational Services was interviewed by Wink. Learn more About Us. Well, I’m back for more. This is my second blog posting and I bring good news. Larson Educational Services, my family-owned real estate education provider with classes in Fort Myers and Naples, was interviewed by Wink News reporter, Jeremiah Jacobsen, as the number of people looking to real estate as a career increases. With the current state of the economy, many people are returning to real estate as a career opportunity. In around 30 days, an individual can obtain their Florida real estate license and be active in the business of real estate transactions. 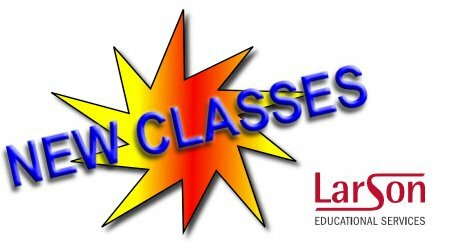 Larson Educational Services offers the real estate licensing class in two locations. Jeremiah even interviewed a couple of our current students, Mary Gano and Roy Hyman. We’ve already heard a lot of buzz due to this report and hopefully it continues to progress. Tonight, March 18 from 6:30pm-7:30pm, we have our monthly “Real Estate Career Night”. Check out the details at http://www.LarsonEd.com. Hopefully I am able to stay up to date with this blog and continue to add new and relevant postings.